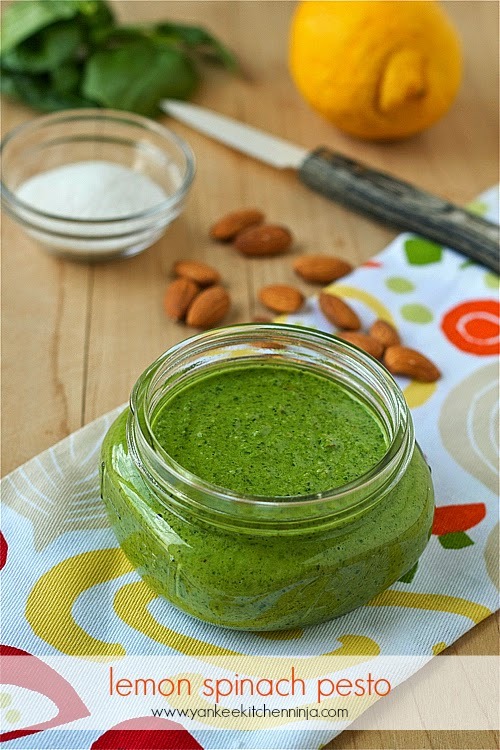 Quick and easy lemon spinach pesto made with almonds and parmesan cheese -- enjoy on pasta, pizza, crostini and more. And it freezes well, too! I rarely think about pesto in the winter. Now, I probably should -- the bright colors would certainly cheer up a dreary, gray December day. I mean, remember my hot pink beet pesto? Ha cha cha, now that's a color! But when summer rolls around? Awwwww yeah, bring on the pesto, baby. Pesto is so absurdly easy to make, what's not to love? Whirl up a couple handfuls of plentiful herbs or greens along with some good olive oil, nuts and cheese and -- voila! -- you've instantly got the makings of a quick dinner, appetizer, pizza, you name it. Once you master traditional basil pesto, start thinking outside the box. Again, remember the hot pink beet pesto? Or my caper pesto? That's some good stuff right there, peeps. Today I'm suggesting spinach pesto. Yes, spinach -- loaded with vitamins and other healthy, good-for-you stuff. You've been cramming it into sweet smoothies for months now (thanks to Detox January), so why not follow the same principle and turn that spinach into some yummy savory pesto? 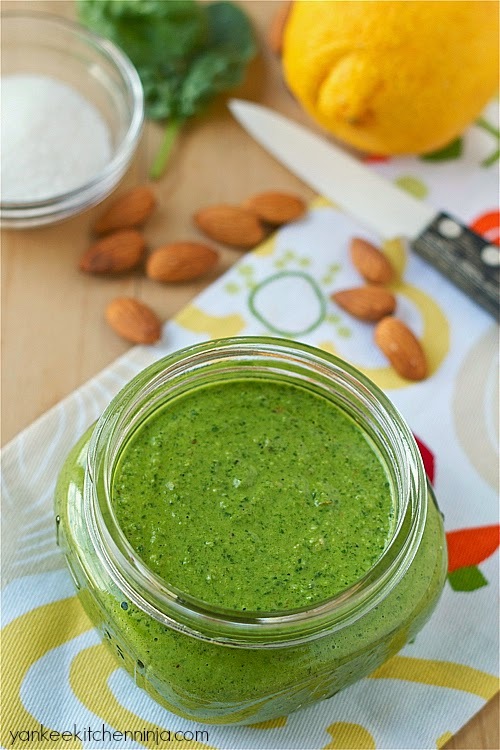 For this pesto, I teamed healthy spinach with bright lemon, almonds and parmesan cheese. Rich and nutty but with just the right amount of lemony tang. Wicked good stuff. Here's my recommendation: Make this spinach pesto on the weekend and then divide it between two jars. Keep one jar in the fridge for the week; dollop it into some hot pasta or schmear it onto a pizza shell or naan for a quick, no-fuss weeknight meal. Pop the other jar into the freezer for when you need an emergency meal (you can quickly defrost it in a pan of hot water). Booyah: About five minutes of effort will yield you about four easy weeknight meals. Now leave some comment love for The Ninj in return. To a food processor add the spinach, almonds, peel. juice and garlic and pulse until well chopped. With the processor running, stream in the olive oil and process until smooth. Add the cheese and salt and pepper to taste and again process until smooth. You know, I think I've made every kind of pesto but spinach! This looks amazing! Pesto is so hard to shoot, but you nailed it! Oh, and freeze some of that pesto in ice cube trays. Then pop it out the next day and store it in a big bag in the freezer. Now you have pesto in the winter. :-) I call those pesto "bombs," and you have to yell "incoming" whenever you drop one in the pan or soup. PESTO BOMBS! I love it, David -- thanks! LOVE pesto. It's so versatile and love all the endless variations you can play with... like this lemon spinach flavor sensation. I'd like to have me some of that in the fridge right now! I'll never be able to call them anything other than pesto bombs now, Chris!